Hi everyone, my name is Paige, and I think pumpkin flavor is just okay. It’s heresy to say, especially during fall, I know. But it’s kinda true – so many pumpkin-flavored things are a little bland. 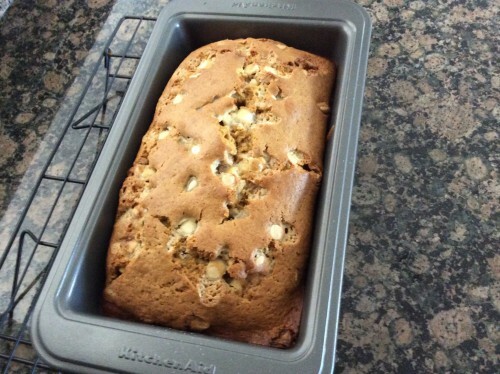 However, I think I may have the recipe to end that: white chocolate chip pumpkin bread. Here’s the story, I went home two weekends ago to visit my parents in St. Louis (it had just been too long since we’d last spent time together). My mom has a moderate intolerance for gluten she developed just a few years ago, but she hasn’t let it take over her life or keep her from enjoying food. Instead, she’s gotten creative and great at tweaking recipes to be gluten free. 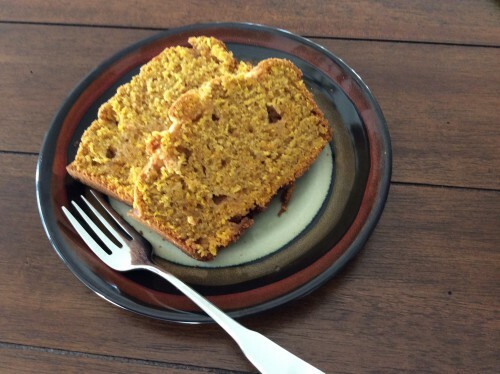 While I was home, she whipped up an excellent gluten free pumpkin bread that I couldn’t get enough of: perfect sweetness, perfect pumpkin flavor, perfect fluffiness and perfectly gluten free. When I got back to Atlanta, I was bound and determined to make my own version, and for fun, I threw in some white chocolate chips I had on hand. Great bolt of last-minute inspiration. Fresh off the cooling rack, this pumpkin bread tastes great – even Sean (who also doesn’t get jazzed for pumpkin-everything) agrees. I think you will too. In a large bowl, combine the pumpkin, eggs, oil, water and vanilla extract with a spoon or hand mixer. In a smaller bowl, mix together the dry ingredients: sugar, flour, baking powder, baking soda, salt, cinnamon and nutmeg. A little at a time, add the dry ingredients to the wet until it’s all combined, and the batter is pretty thick. At this point, dump in the majority of the white chocolate chips (hold back some to sprinkle on top), and mix it in gently with a spoon. Pour the batter into a 9×5 inch, greased loaf pan (or two smaller 5×3 inch pans), sprinkle any remaining white chocolate chips on top and slide into the oven. The loaf should take 55-60 minutes (35-40 for smaller pans), and when it’s ready a toothpick inserted in the middle should come out clean. Let it rest for 20 mins in the loaf pan before removing to let it cool completely on a wire rack. Once it’s cooled completely, slice and enjoy. Let the loaf cool in its pan for 15 – 20 mins after coming out of the oven. Gently remove the white chocolate chip pumpkin loaf from the pan and let it finish cooling completely on a wire rack before slicing. Serve the sliced loaf with coffee (or whatever) and dig in! 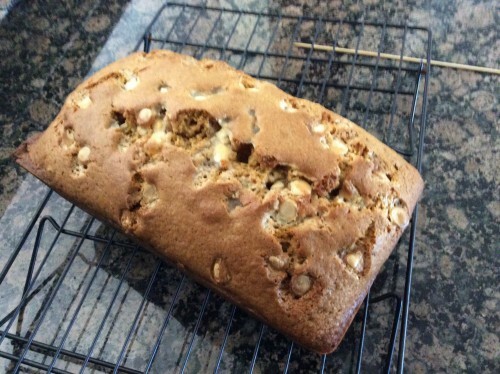 This entry was posted in Desserts, Recipes and tagged Bread, Chocolate Chip Pumpkin Bread, Desserts, Fall, Gluten Free, Pumpkin, Pumpkin Bread, Recipes, White Chocolate, White Chocolate Chip, White Chocolate Chip Pumpkin Bread on October 22, 2014 by Paige N..